Flying Trade Group operates across several sectors of the UK food and leisure industry - its main subsidiary businesses includingSurya Foods, one of the largest suppliers of authentic world foods in the UK, and Surya Hotels. Established in the 1980’s, Surya Foods is a rapidly expanding, family run business. It supplies a variety of high quality, authentic ethnic products ranging from rice, flour, spices and sauces to snacks and savouries that are sold in over 30 countries worldwide. Surya Foods is one of the largest suppliers of authentic world foods to the UK food sector. Its unrivalled, extensive world food ranges has seen it become the biggest supplier of world food lines into supermarket giants Tesco, Asda, Sainsbury's and Morrisons, with extensive independent retail accounts across the UK. Laila basmati features in the UK's top ten rice brands,according to 2015 Nielsen data. The Laila brand has expanded rapidly in recent years and now includes a complete range of flours, attas, ghee butter, pickles and curry pastes, sourced from around the world, to help UK consumers create delicious, authentic dishes in their own homes, using a brand they have come to know, love and trust. Surya's evolving ranges cater to the South Asian, Korean, Chinese, Thai, West African, Caribbean, African, South American and Polish communities, with Arabic and Mediterranean products added to its world food line up in 2015. With 2,000 products available, Surya represents over 50 agency lines from some of the world’s leading companies. Surya Hotels, Flying Trade's existing and expanding hotel portfolio, currently owns eight hotels across the UK, including Hallingbury Manor and the Kingscliff Hotels in Essex, the Duke's Head in Norfolk and Legacy Mill Hotel in Suffolk. 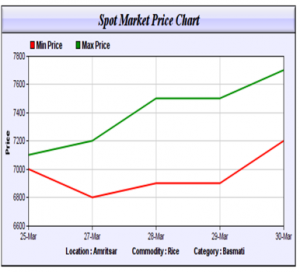 Raw Material and Finished Product Prices in Origin: Basmati Paddy Prices are up by close to 40% in last 5 months since the new crop arrived in Nov 2016. 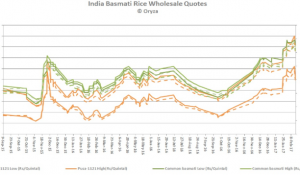 Basmati finished product for wholesale prices have increased by 35% in last 3 months and there has been a significant upward trend (in last 2 weeks on account) of depleting market inventories. Chart 1 & 2 provide insight on trend of prices over this period and current short term scenario. 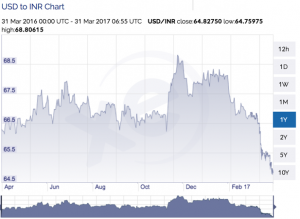 INR to USD currency trend: From close to an all-time high of 68.50 INR / USD in Oct, Indian Rupee has strengthened back by 7% in last 4 months, leading to lesser realization of exporters in INR terms and thus increased cost of exports. With an increase in the confidence level of FII’s post demonetization move in Nov 2016 and BJP winning in key state elections in March, INR is expected to be strengthening further. Chart 3 provides insight into the currency trend. Chart 3: INR to USD, 1 Year Currency TrendGBP to USD currency trend: From 1.59 levels in March 2015, GBP has depreciated by around 24% and it stands at 1.215 levels in Mid-March 2017. A Depreciation of app. 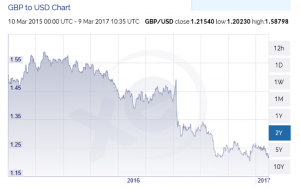 15% in last 6 months itself is leading to higher cost of Import into U.K. Chart 4 provides insight into the trend. 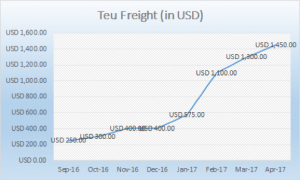 Due to various factors collated together, there is in general a shortage of Basmati Rice in U.K.
Shortage of containers and space with shipping lines and enforced weight restrictions in march 2017 are adding to the woes. Some millers are already re-negotiating ongoing contracts. Also with limited stocks to sell, sales are being affected on the basis of priority stock allocations. Prices are expected to remain firm. Brexit: With Re-negotiation of Brexit in process, the future impact on Imports, Trading and Tariffs is unknown and may require 2-3 years to understand the real impact. Labour Rates and Operating Costs for Manufacturing & Distribution in U.K: Due to inflationary pressures and the evolution of markets taking into account factors like Brexit, operating costs in U.K have increased by around 4% in last 1 Year. This is adversely effecting the costs and therefore the need for price increases. Pesticide Restrictions and chances of industry to get skewed: With max allowed levels of 0.01% to be allowed and upcoming stringent controls post Dec 2017, there are chances of many fragmented segment players either moderating down or existing from the market. Also this will lead to a rise of a need to control at agriculture level from major players, which would come at a price and would increase costs. Laila is one of the UK’s leading basmati rice brands and is owned by world food giants Surya Foods. It is the top selling rice brand on the world food aisles of national retailers Tesco and Asda. Established in 1996 to bring high quality, authentic basmati rice to the rice-eating Asian community of the UK, Laila has become one of the nation's favourites, popular with consumers and ethnic chefs alike due to its quality and authenticity. Surya Foods is one of the largest suppliers of authentic world foods to the UK food sector. Its unrivalled, extensive world food ranges has seen it become the biggest supplier of world food lines into supermarket giants Tesco, Asda, Sainsbury's and Morrisons, with extensive independent retail accounts across the UK. Laila basmati features in the UK's top ten rice brands (2015 Nielsen data). Laila Basmati launches ‘Love Laila Naturally’ strapline – as it continues to roll out global, multi-million pound rebrand to attract new consumers to the brand. Laila Basmati launches ‘Love Laila Naturally’ strapline – as it continues to roll out global, multi-million pound rebrand to attract new consumers to the brand. The move comes as Laila adds more than £3m YOY to the rice category with sales growth of 34.6% during the last year. (Nielsen 2018) With annual sales now edging toward £12m, Laila has achieved the biggest branded growth among the Top 3 UK dry rice brands for the second year running. Laila owners Surya Foods has also seen a return of its Salaam rice brand to the UK Top 10. The transformational rebrand kicked off with the introduction of 100% recyclable packaging across its entire range of smaller bags last November. Now, Laila is building on its brand positioning with an update to its strapline, replacing ‘Love Rice, Love Laila’ with ‘Love Laila Naturally’. The evolution of the brand’s signature heart into a butterfly motif, reflects the transformation of the brand as it doubles efforts to attract a mainstream audience while celebrating its ‘natural, environmentally friendly’ credentials. The motif will start appearing on packs from DATE. The new look is being launched to the trade at the international Gulfood 2019 food festival, in Dubai this week - the world’s biggest food and beverage trade event with 5,000 exhibitors.